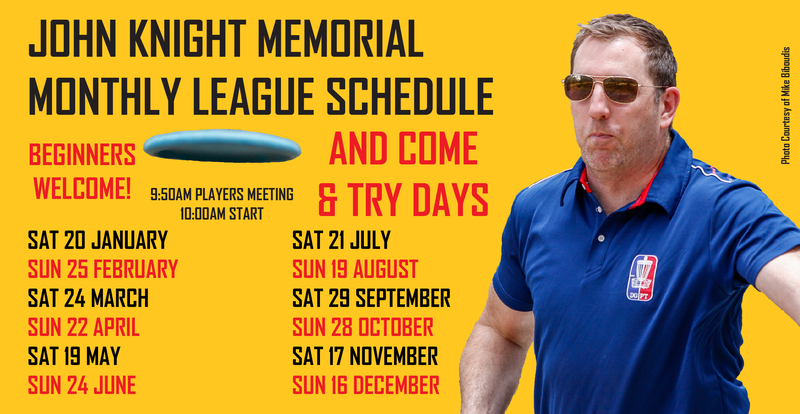 This page has all the links you need to play, purchase discs, meet people and compete in the ACT. 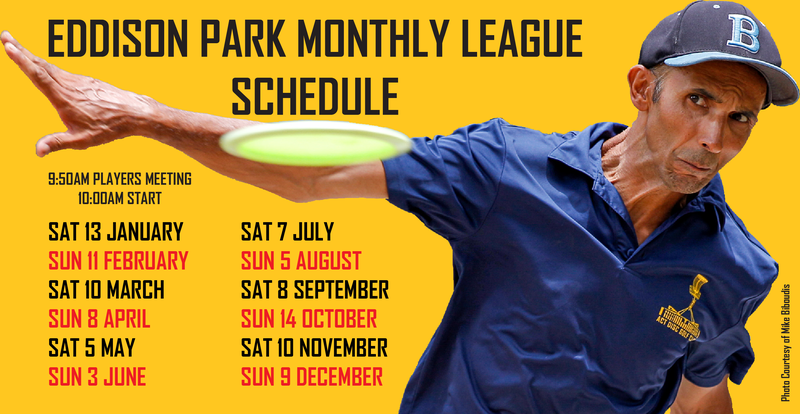 If you are new to Canberra, or just visiting, and want to hook up with some locals to play, the best option is to go to the ACT Disc Golfers Facebook page. Weston Park now has a permanent course! Leading up to The Choices Flooring 2018 Australian Disc Golf Championships Presented By Nature 2 Nourish, many of the poles were permanently installed and there is now a permanent 21 basket layout to be played! All tees are denoted by orange plastic markers that are in the ground for every hole on the course. Holes 4 through 24 have full baskets installed and it is recommended to just play these. Holes 2 and 3 have poles only. Holes 1, 25, 26, and 27 do not have the basket locations marked. If you’ve played the tournament course before, you’ll note that Hole 12 has been shortened into a Par 4 for the public layout which plays great and makes the transition better to 13. The basket on Hole 18 was removed due to the proximity to the SIEVX Memorial and after consultation with the memorial committee, the basket has been relocated and the hole shortened into a Par 4. 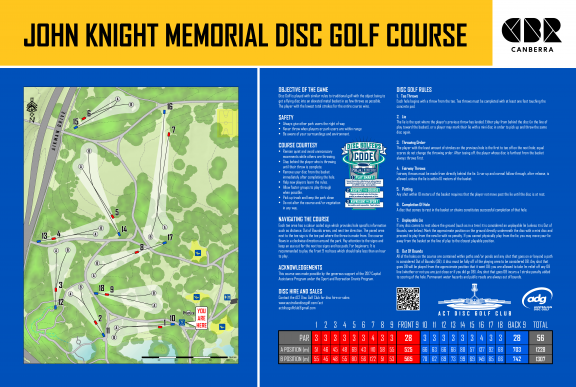 If you are new to disc golf, then make your way over to the John Knight Memorial Disc Golf Course which is a 9 basket, par 56 course with dual tees and dual pin positions making for 36 unique holes to play. It is fully signed with a main sign board, practice basket, tee signs, concrete pads, and next tee signs for a couple of holes. The course is beginner friendly with the front 9 ranging between 45 and 65m for the Par 3’s with the back 9 playing longer and more difficult. The course is mostly wooded set amongst native gum trees with a couple of holes shooting over mowed parkland. Despite the short holes, there are numerous trees on some holes which make it more difficult if you don’t hit your intended line. Many of the holes are also contained by a path network that plays as out of bounds for each hole. Thus, running long on many of the holes will be OB and cost you a stroke; this adds to the challenge of the course but can be ignored for casual play and beginners. However, for more seasoned players, it is a great course for working on your short game and making sure you are accurate or else you can be punished. The locally made custom baskets at Eddison park have been in the ground for over 20 years now and were one of the first basket installations in Australia. 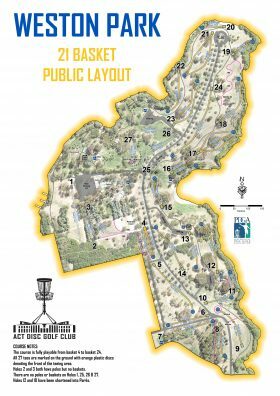 The park has seen some significant changes over the years including the addition of the skate park, upgraded path networks, fitness equipment installations, and the possible loss of half of the course due to the cemetery expanding on the south side of Justinian Street. All of these changes have impacted the course into various iterations and due to the criss-crossing nature of the current layout and multiple park user conflicts, it needs some work to be revamped in the near future. As of this writing, the cemetery expansion has been turned down which is great for Eddison Park! Currently, there are 9 permanent baskets with dual tees making 18 holes for each the white and gold layout. There are no tee signs but there are coloured plastic ground markers (white and gold) that denote the front of the tees for the two courses. If you’ve never played the course before, I’d highly recommend using the links below to bring up the course map in Google Maps where you can use your GPS location to easily find each tee and where to go to next! All Coloured tees follow the same flow from basket to basket; thus, when playing in a group of varying skill levels, players can choose the tee which best suits their ability and still all play together. For 2019, we have decided to use Disc Golf Metrix for all our scoring and handicaps. Thus, all players MUST create a Disc Golf Metrix account in order for their handicap to be calculated. Disc Golf Metrix uses a rating system similar to the PDGA for individuals but also rates courses. So, the handicap is based on how well you play compared to the course rating rather than other players. It works well and provides all your hole scores, keeps track of all your rounds, and lets you compare yourself with others even during play by having live scoring. First time players with no handicap play for free. After playing the first round, you will be given a handicap. The winner on the day is typically the most improved player playing better than their current handicap. Cost is $5 for members and $10 for non-members. Multi-packs available to cover all league days. League points: 15 for the winner, 14 for 2nd, 13 to 3rd, etc 15th and beyond all receiving 1 point. Ties get the same score and split the difference. Players total at the end of the League is their top 6 scores. Get ready to play a whole bunch of disc golf in the beautiful Snowy Mountains! 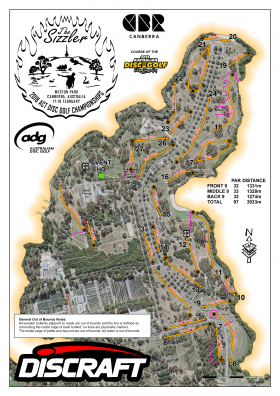 The ACT Disc Golf Club is hosting a fun filled tournament spanning the 5 local courses over the three days of the Australia Day Weekend 2018. The plan is to play one course Friday afternoon and two on Saturday, and a final two on Sunday. All courses will be played on the local standard layout to keep things fun and simple. The emphasis will be on social disc golf where we will be having mixed division cards for all rounds to spice things up a bit. Tournament accommodation is being perused so stay tuned here to get the scoop. The plan will be to have all participants stay in the same area so to engage in nightly social gatherings and events. So stay tuned for now but lock the dates in and watch this space for more details. Sign up now! The ACT Disc Golf Club is proud to bring you the 2018 Sizzler – ACT Disc Golf Championships. If you’ve been waiting for an update on this event, apologies for the delay. After much deliberation, we have decided to change the venue for the Sizzler this year to the Australian Championships Course which will be held in November at Weston Park. Many of us felt that it would be better to put in the effort on the champs course to really dial it in and to also help work on making this a permanent venue in the future. So, while West Lake Ginninderra might be a venue we could use in the future, we will be holding the Sizzler at Weston Park. That being said, you will likely be stoked that we have made this change as the course is looking amazing and we will be playing on a championship level 27 basket course. If you came to the Sizzler last year and liked the course, the new course is only better! Many of last years holes will be either the same or slightly modified with an extra 9 holes added which will eliminate some walks and allow for a bit better flow. Register for this exciting tournament here! Please add your name and event in the description please. We are currently working on some great venues for the tournament and can ensure that this will be a fun and social weekend of great disc golf. There is a putting course in Eddison Park on Basket #2. There are 21 locations marked with yellow markers (going from close to far in an ‘S’ pattern). You get one shot at each location (easy to hard). Your score is the total number of completed putts. Count the number of putts it takes to complete all 21 locations. !! !Current Membership list is here!!! get a flying disc into an elevated metal basket in as few throws as possible. movements while others are throwing. until their throw is complete. immediately after completing the hole. Each hole begins with a throw from the tee. Tee throws must be completed with at least one foot touching the concrete pad or behind and between the front of tee markers. The lie is the spot where the player’s previous throw has landed. Either play from behind the disc (in the line of play toward the basket), or a player may mark their lie with a mini disc in order to pick up and throw the same disc again. The player with the least amount of strokes on the previous hole is the first to tee off on the next hole; equal scores do not change the throwing order. After teeing off, the player whose disc is farthest from the basket always throws first. allowed, unless the lie is within 10 meters of the basket. Any shot within 10 meters of the basket requires that the player not move past the lie until the disc is at rest. If any disc comes to rest above the ground (such as in a tree) it is considered an unplayable lie (unless it is Out of Bounds, see below). Mark the approximate position on the ground directly underneath the disc with a mini disc and proceed to play from the new lie with no penalty. If you cannot physically play from the lie, you may move your lie away from the basket on the line of play to the closest playable position. Any areas marked on signs or on the course description are Out of Bounds (OB). A disc must be fully off of the playing area to be considered OB. Any shot that goes OB will be played from the approximate position that it went OB; you are allowed to take 1m relief off any OB line (whether or not you are just close or if you did go OB). Any shot that goes OB incurs a 1 stroke penalty added to scoring of the hole. Permanent water hazards and public roads are always out of bounds.